At the bottom of this blog is a list of what I played on the air last night (8/22). If you missed the broadcast the MP3 will be available for download (free) at www.easy-ed.net later this weekend. Right after the show I zipped (as much as one possibly can zip in Boston traffic) down to the Midway for the first of the two Alvis shows. I was running late but managed to get my DJ stuff set up in time to get going at 9:30. Lots of fun, and it was great to see so many familiar faces, in the band and audience. It felt a little like a Cranktones show circa '96! The "I Like Alvis" pins designed by Kathy W. were a hit. The Midway was packed and boppin' by the time Alvis took the stage at 11:00. The FTW Band, clad in white and donning "FTW" lightning bolt necklaces, was fantastic. I was happy to see Vic from Boston Rockabilly Music Conspiracy playing keyboards. My good buddy Stan (Cranktones, Spurs) was on drums. In addition to bass brillance, Jimmy from Rocky Velvet is a master of disguise: His Jerry Schiff tribute costume actually scared the hell out of me. Billy Coover was perfect on guitar and the horn section was great. The Nutri-Sweet Sensations sounded great, were obviously having a blast, and were fun to watch. As for Alvis himself, I'm having a rib cage hangover today. I have not laughed myself into literal pain in a long, long time. His personal security guards (Sonny and Red) helped keep hysterical females from bringing the show to a halt during the sweaty scarf distribution ceremonies. I got home at 2:30 (earlier than predicted), and the whole thing repeats itself tonight. Scobiwan had his cameras going, so I hope some of this will be captured for youtube. I'll keep you posted on that. This past Wednesday I was DJing at River Gods in Cambridge with P.J. Eastman. A very different kind of night, but what a great time. That little club has a very special atmosphere that I can't adequately capture in writing. It's dark and cozy and consistently welcoming. Both P.J. and Jason play great stuff. I'd be there every Wednesday (if I didn't work every Thursday bright and early). That said, River God Wednesdays are a night out worth losing sleep over. We're really looking forward to the Red Hot and Blue Festival in Montreal next weekend. 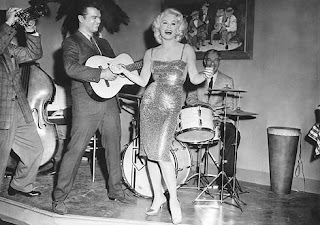 Rockabilly, dancing, great bands--that's for me! Bill Hunt from Cow Island Records emailed me a preview track by the Dixons (see the picture in this blog) and I played in on last night's show. Also great to see Laika & the Cosmonauts will be here in October, also at Church in Boston. I liked that club better when it was The Linwood and had lots of cigarette butts ground out on the linoleum, but if Church will keep getting good shows on the schedule I'll have good reason to get nominally reverent. Don Helms "Big News" from Various: Nashville Steel Guitar on Starday Records — Don Helms (February 28, 1927 - August 11, 2008) was a steel guitarist best known as a member of Hank Williams' Drifting Cowboys group.He was featured on over 100 Hank Williams recordings. Here's what I played on tonight's show. If you missed it and would like to check out this episode just go to http://www.msplinks.com/MDFodHRwOi8vd3d3LmVhc3ktZWQubmV0 later this weekend and the archive will be posted there. Gene Ross "Everybod's Trying to Kiss My Baby" from Various: That'll Flat Git It! Vol. 16 on Bear Family Records — I don't have a date on that Sun Records, unissued. MAN what a cool record! 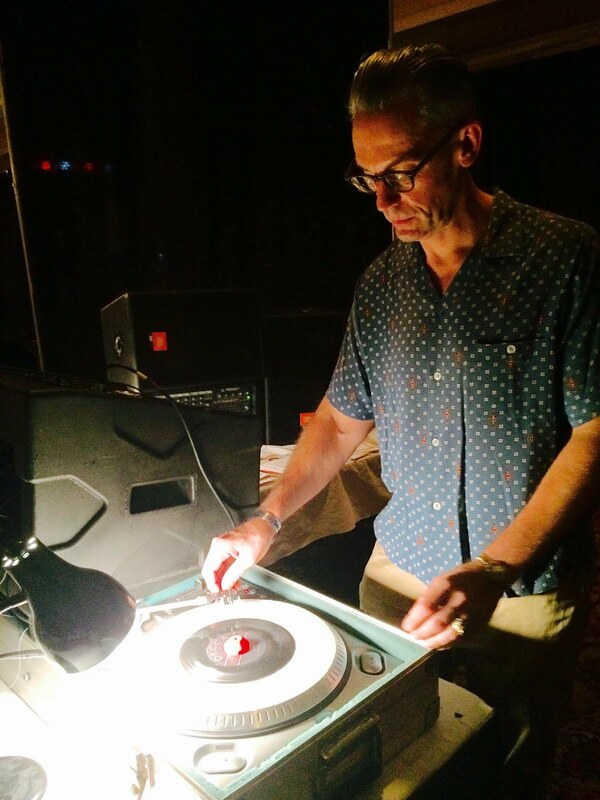 Roll your radio dial (or browser window) over the WMFO this Friday at 6:00 PM and catch “Easy Ed’s Variety Hour”—two whompin’/rtompin’/stompin’ hours of rockabilly, hillbilly, R&B, and rock ‘n’ roll! **When: Friday (8/15) at 6:00 PM Eastern. and download MP3s of past shows from there (gratis). The playlist from my last show appears at the end of this message. --On August 20 I will be DJing live at River Gods in Cambridge as part of their ongoing Primitive Sounds series. I want to thank Jason Beek, P.J. Eastman, and the folks at River Gods for the invitation. Please stop by! The music starts at 9:00 PM. --August 28-31: Check out the Red Hot and Blue Festival in Montreal, featuring Sleepy LaBeef, Ace Brown and His Ohio Valley Boys, the Roy Kay Trio, Nate Gibson and the Gashouse Gang, the Honeybees, Miss Wolff's Jiving School, and more! Here’s the playlist from the 8/1/2008 edition of Easy Ed’s Variety Hour. We started a bit early with some instrumentals and twisters before officially kicking it off with one of the greatest songs ever, “That's The Way I Feel” by Jimmy Pritchett! To download archived shows just go to www.easy-ed.net. Thanks! I need your help. Please sign an online petition to save the Rockin' Fifties Festival held in Green Bay Wisconsin. Festivals of this kind are vital to the rockin' and roots music scene in the U.S. I've been told that the organizers of this event "might" do it again if enough interest is show. Even if you don't plan to attend the event (and I urge you to if it is held--just go to the event link below and check out the pictures from last time!) please sign the petition as a way of showing support for the bands and music fans who greatly benefit from this landmark music festival. Thanks for checking out this blog! I've got a new episode of Easy Ed's Variety Hour coming up this Friday (8/15/08) and I'm happy to play your requests. Send 'em along to dj_easy_ed@yahoo.com. 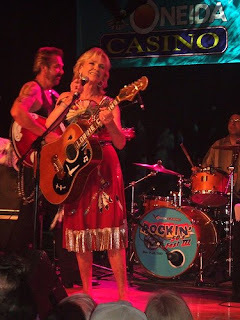 If the show is new to you, I play hillbilly, rockabilly, and 50s/early 60s R&B and rock 'n' roll. Here's a link to my last playlist if you want to get a better idea of what I like and play. The show airs in the Boston area on 91.5 FM, but we also broadcast worldwide via the Internet. You can connect through wmfo.org or iTunes (Radio/Public/WMFO). I play lots of vintage music, but also like many current bands. I continue to be impressed by all the great new rockin' music that's coming along every week. (Capitol Records 1956) and thinking it would be a great one to play early at a record hop to get folks up and jiving! Welcome to my blog! Check out my latest show here.